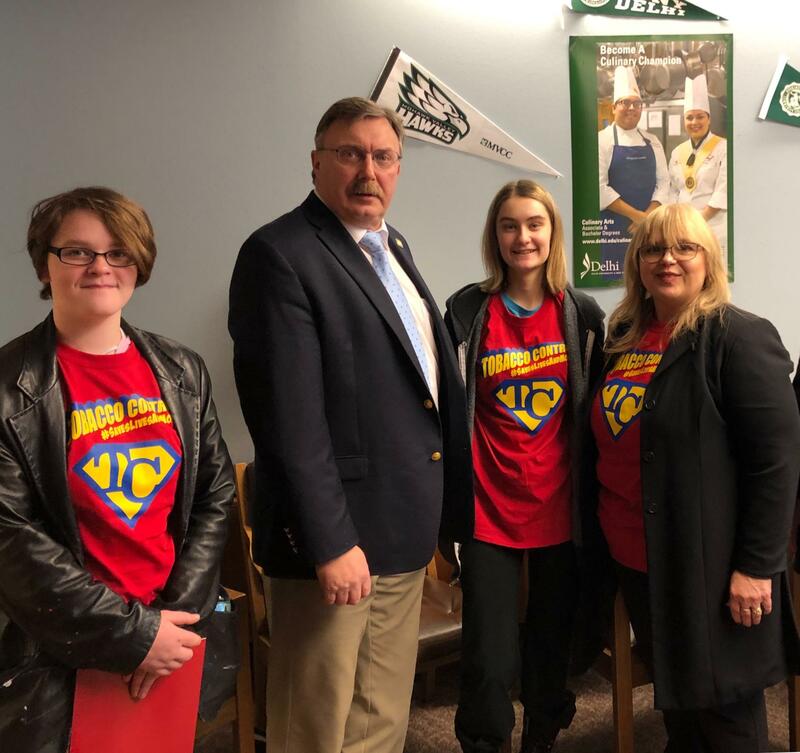 New York State (NYS) Tobacco Control Partners and Reality Check youth visited Albany February 4 to talk with lawmakers about the success of their programs at lowering the NYS adult smoking rate to 14.2 percent as well as unmet needs in tobacco control. In The Well of the Legislative Office Building, youth leaders hosted an interactive, life-sized board game called “Tobacco Trouble” set up to highlight recent tobacco control successes and the continued fight against Big Tobacco and how the tobacco industry has overfilled the state’s retail outlets with tobacco products. Representatives from Advancing Tobacco Free Communities in Delaware, Otsego and Schoharie Counties (ATFC-DOS) met informally with NYS Senator James Seward and NYS Assemblyman Chris Tague and participated in structured meetings with Assemblyman Clifford Crouch, Assemblyman Brian Miller and Senator Jen Metzger while in Albany for the annual NYS Tobacco Control Partners Legislative Education Day. Linda Wegner, ATFC-DOS Program Director, Deyanira Cisneros, ATFC-DOS Community Engagement Coordinator and Bonnie Peck, ATFC-DOS Youth Engagement Coordinator accompanied six Reality Check youth advocates. Gabe Oakley, Arianna Mosenson, Johanna Mosenson and Jillian Johnson from Cherry Valley-Springfield Central School and Jasmine Neill and Ava Valetutto from Sharon Springs Central School helped educate lawmakers about local tobacco use issues. They also shared their concerns about tobacco and e-cig marketing from recently completed tobacco retailer observations. 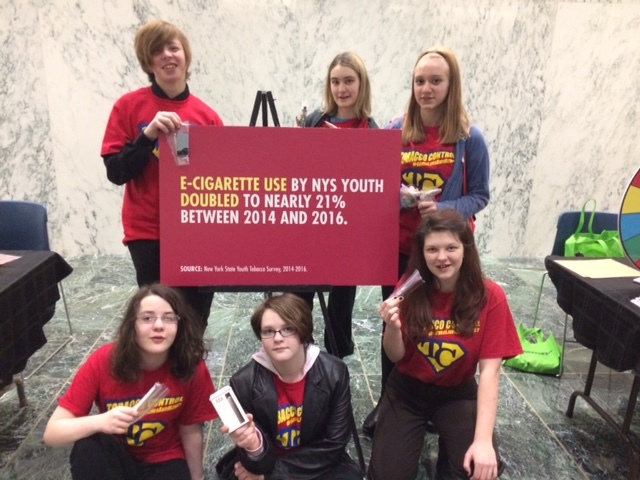 “Not only has the youth smoking rate in New York State increased for the first time since 2000, but data reveals that more than 1 in 4 of New York’s high schoolers is using electronic nicotine devices,” said Bonnie Peck, ATFC-DOS Youth Engagement Coordinator. “With more than half of teens falsely believing e-cigarettes are harmless, adolescent nicotine exposure can cause addiction, it can harm the developing adolescent brain and it can increase the risk of adolescents starting and continuing smoking combustible cigarettes.” Between 2014 and 2018, the rate increased fully 160 percent, from 10.5 percent to 27.4 percent, and studies show e-cigarettes can be a precursor to cigarette smoking in youth, even those who were not likely to smoke cigarettes. Smoking costs New York State $10.39 billion in annual health care costs. This expense results in a tax burden of $1,410 for each household every year. And, each year 28,200 New Yorkers die due to smoking, and thousands more live with illnesses related to tobacco use. The smoking rates in the Delaware, Otsego and Schoharie region are higher than the current statewide adult smoking rate of 14.2 percent - 23.4 percent for Delaware County, 19.7 percent for Otsego County and 18.1 percent for Schoharie County. The CDC recommends that the Tobacco Control Programs in New York State be funded with $203 million, yet actual funding for these programs totals $39 million. The health and economic burdens of tobacco-use could be significantly reduced if these programs were fully funded.